I think this is the first time I’m blogging about Starbucks while in a Starbucks coffee shop, and finishing the whole article, that is. As of this writing, the rain is heavily pouring on a Tuesday afternoon just outside Starbucks 6750. It’s also the first day of Starbucks’ new beverage called Starbucks Refreshers offered in Cool Lime and Very Berry Hibiscus. The new innovative drink is a combionation of green coffee extract with either lime (for Cool Lime) or blackberries (for Very Berry Hibiscus). 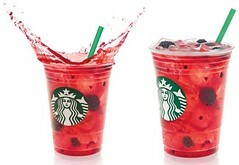 The Very Berry Hibiscus Starbucks Refreshers™ beverage is made from real fruit juice, green coffee extract and whole blackberries. 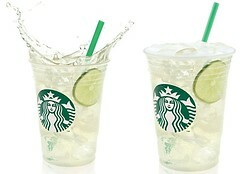 The Cool Lime Starbucks Refreshers beverage contains real fruit juice as well, green coffee extract and a slice of lime. Both are hand-shaken with ice for a moderate-calorie, thirst-quenching drink and priced as follows: Tall – ₱115, Grande- ₱125, Venti – ₱135. It is interesting to note that the Green coffee extract is an entirely new way to experience coffee – one that doesn’t taste like coffee but has about a quarter of caffeine from the regular roasted coffee. First, the green coffee bean is picked from the coffee cherry from the coffee tree. Now, instead of roasting it after harvest which usually brings about the bold distinctive taste of coffee, the caffeine naturally found in coffee is extracted from the unroasted arabica coffee beans. This is then used as the liquid base for the Starbucks Refresher Beverages plus a right amount of water and ice for the refreshing taste. From July 31 to September 10, 2012, get a complimentary Tall Starbucks Refreshers Beverage for every purchase of 16 oz. Customizable Cold Cup Tumblers (with flat lid and dome lid) . It’s actually a ‘summery‘ drink for me. Ironically, it’s the rainy season here in the Philippines. 🙂 Anyhow, you’ve got to try the new Starbucks Refresher Beverages. I find the Cool Lime more refreshing being in the citrus-y side. 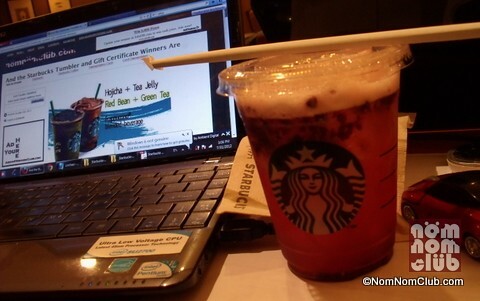 The Very Berry Hibiscus has the same effect but has the sweeter aftertaste primarily due to the blackberries.